The Glasgow School of Art was founded in 1845 and originally governed by a Committee of Management, comprising of a president, two vice presidents, a treasurer, a secretary and ten other members, all of whom were elected by the School’s subscribers at annual general meetings. The Committee was responsible for the whole management and direction of the affairs of the institution, and the appointment of all officers and servants with the exception of those appointed by the Government Council at Somerset House. In 1892 the Committee of Management was replaced by a Board of Governors, following the School’s incorporation under the Companies Acts in that year, and the President was replaced by a Chairman. Representatives were now elected from the principal public bodies of the City of Glasgow. The Board of Governors are still responsible for the overall direction of the School and many of the important decisions made, and so I knew there were many important records to be found within the records of this body, known under the archive reference ‘GOV’. 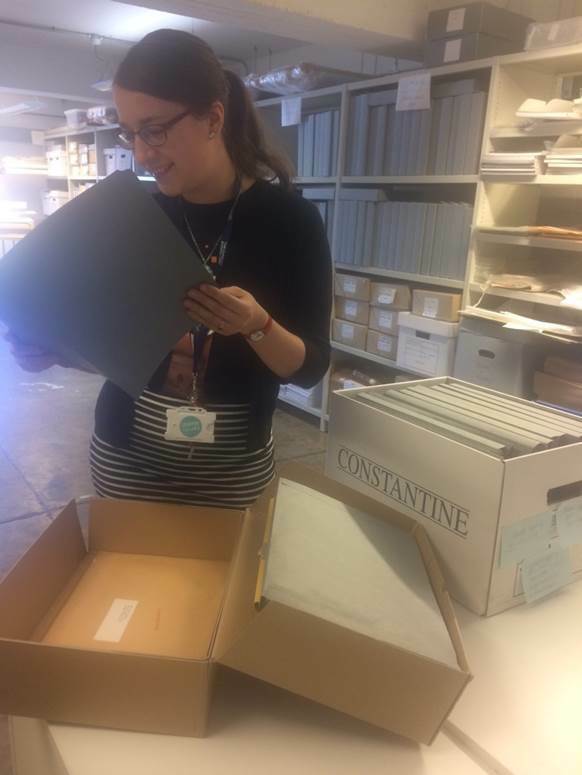 Some of my favourite records that I discovered and catalogued in this section were those that relate to the foundation of the Glasgow School of Art and the legal documents that allow the institution to teach and practice. Under reference number GOV/4/1, I have catalogued the ‘Memorandum and Articles of Association’ of the Glasgow School of Art, dating from 1892: a document that forms the institution’s constitution, defines the responsibilities of the directors, and the business to be undertaken. There have been a number of amendments to these articles throughout the years and these are also listed here. I also discovered records relating to the Haldane Academy Trust, for example a handwritten constitution for the ‘Glasgow School of Art and Haldane Academy’ from 1870 (GOV/4/3/3). For a spell during the 1860s-1890s the School of art was called the ‘Glasgow School of Art and Haldane Academy’ after receipt of funding from the Haldane Academy Trust, (a trust set up by James Haldane, a Glasgow engraver, in 1833). By 1891, however, the “Haldane Academy” was dropped from the title as the School was being confused with the Trust. I also discovered some interesting inventories of Glasgow School of Art property. Until now, the earliest known catalogue for Glasgow School of Art books and casts dated to 1847 but I came across an earlier inventory that actually pre-dates the foundation of the School in 1845. This catalogue of casts and books, prints, plans and statues, dates to 1844, part of which appears to be a record of a sculpture collection which was sent to the Glasgow School of Art by the Government School of Design in South Kensington so that GSA could choose sculptures to make casts from for the teaching of students who would enter the school the next year. 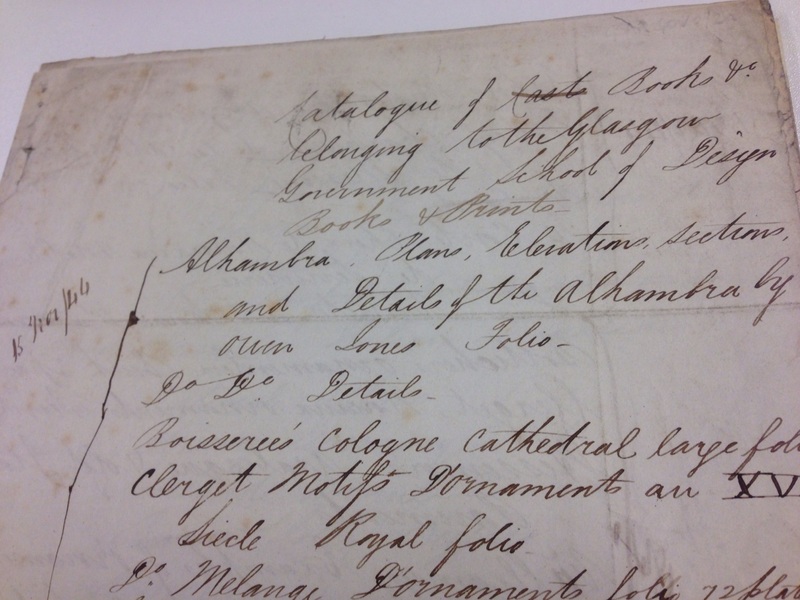 There is also a letter explaining this from Somerset House, which shows the provenance of the collection coming from the French Industrial Exposition of 1844, held in a temporary structure on the Champs-Élysées in Paris. You can find the catalogue entry for this early inventory under reference number GOV/7/12. You can access the catalogue for these records, and the rest of what I found in the Board of Governor’s papers, here. If you’d like to consult any of the material older than 30 years, you can find out how to make an appointment to visit us here. See you again on this blog where I will be sharing more finds throughout this cataloguing project!